Following the handy-dandy checklist I put together for my prophylactic mastectomy back in January, I have gotten everything ready. Based on all the feedback from the Ladies that have gone through the exchange surgery before me, I expect this to be a breeze. The exchange surgery will only take about two hours and will be an outpatient procedure. I should be home by about 4pm. I didn’t borrow a recliner this time, so I built myself a pillow-fort-kind-of-thing on the bed. I prepped a basket of essentials to keep by my bedside. It will travel with me between the bed upstairs and the couch, as needed. The hospital bag is packed with a few essentials like the tablet, hand wipes, chapstick, cough drops, lanyard (for those stinkin’ drains), medications, and my awesome My Destiny Foundation tiara. I have been downing prune juice for the past couple of days to get ahead of the constipation. Also bought some snacks and food items that will be easy to prep while I’m home alone this week. I took the rest of the week off and expect to be doing absolutely nothing. Later gaters. Write to ya from the other side! 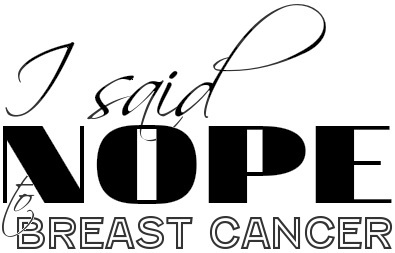 This entry was posted in All, Exchange Surgery and tagged breast reconstruction, Checklist, Exchange Surgery, health, Outpatient surgery, Prophylactic mastectomy, Silicone implants on September 2, 2013 by nope2BC. LOL I was very surprised when my PS said I’d have a couple of drains, because majority of the women that have been through this said they did NOT have drains again. I am still hoping that I will not have any when I wake up. Fingers crossed! Oh, sorry, good luck tomorrow. Good luck!! I think for us who experienced mastectomy, this surgery is like a Christmas Day! LOL I hope everything goes well for you. Sorry to hear about the drains. I had those things for 4 weeks after my mastectomy and was happy to hear that I didn’t have to have them after my exchange surgery. I hope they’ll come out quickly after the surgery. Maybe if you’re lucky, you’ll wake up w/o them!?! Good luck to you. So excited for you! Soft hugs, my friend . You will do fine. I am praying that you are feeling great when you read this !!!! !